In 2014 SKYNET became self aware, decided not to wipe-out mankind, but to create video games instead. 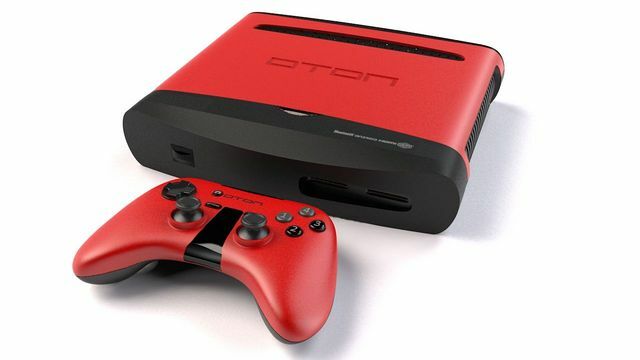 The OTON X is a unique new console that claims to be able to self-create games, without user input. Quite how it manages to do this, we’re not sure (it’s something to do custom algorithms, pre-set design parameters & magic dust), but it is a very interesting concept, and one that potentially will offer users an infinite amount of free games to play. The console will cost $99 for early bird units and $139 for Dev units, so don’t expect PS4 style graphical power but it still has some pretty impressive specs. Specs include a Custom Ubuntu OS, a Quad Core ARM Cortex-A9 processor running at 1.2GHz and the Rear Projector, microphones and camera for voice and motion gameplay (not currently available in Dev or early bird units). So if you like the idea of a truly unique console that will potentially give you free games for life, check out the OTON X, we don’t know how well it will work, but it really is a fantastic concept. Just make sure you unplug it when it starts making games about metalic endoskeletons hunting down and exterminating mankind. A console that can create games sound astonishing I would to try it!